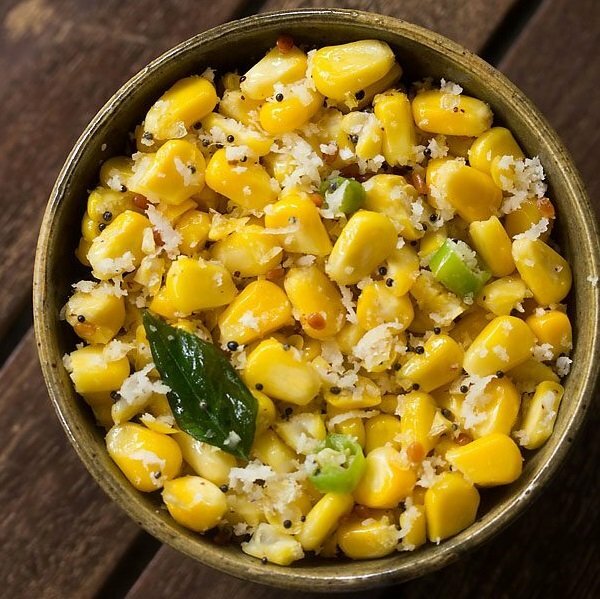 easy recipe of south indian sweet corn sundal. 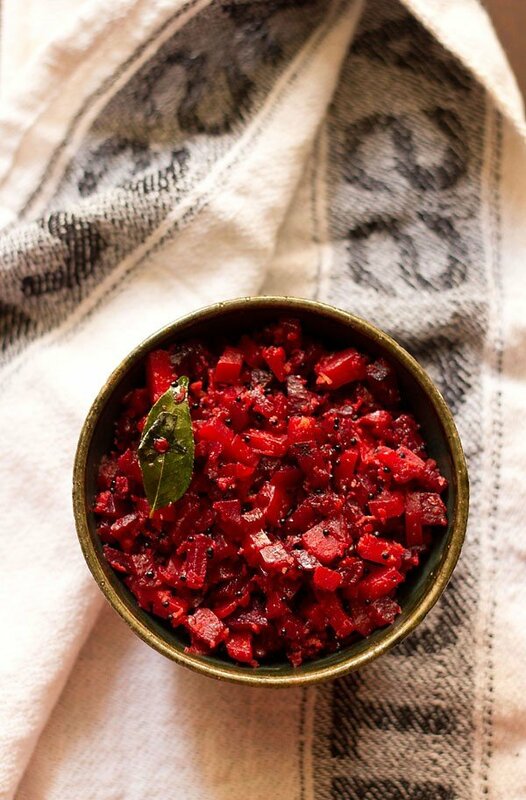 sundals are south indian based dishes made with a variety of legumes and is prepared during ganesh chaturthi or navratri festival. 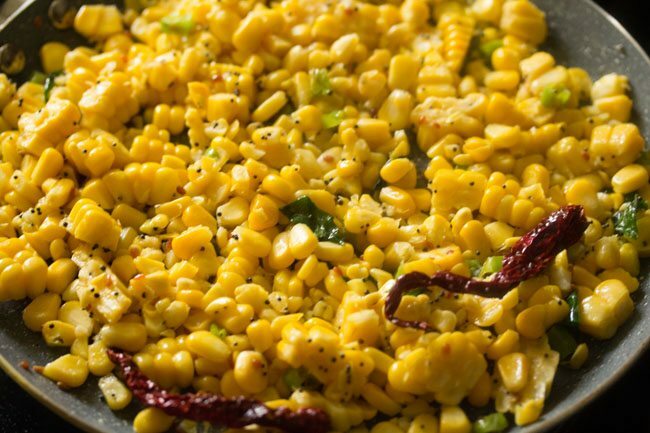 sweet corn sundal recipe with step by step photos – easy recipe of sweet corn sundal for navratri festival. 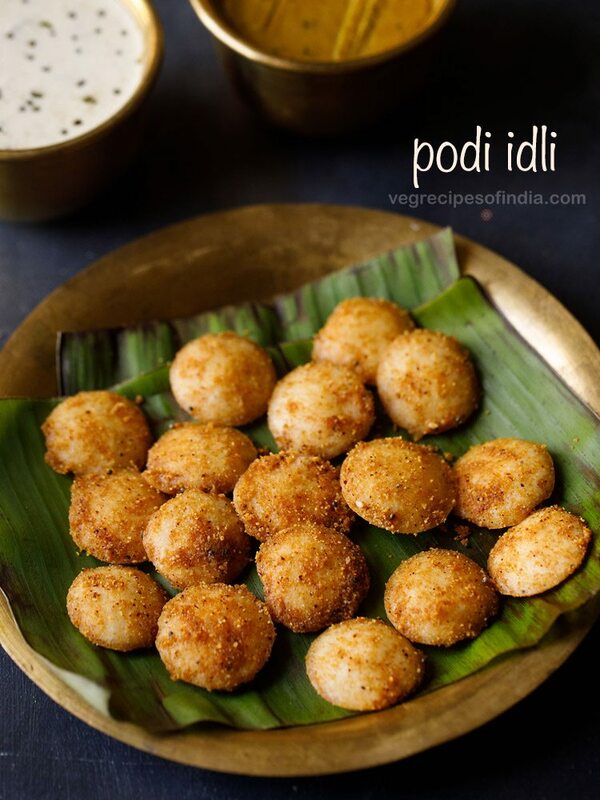 sundals are south indian based dishes made with a variety of legumes and is prepared during ganesh chaturthi or navratri. though you can even make them on regular days too. usually i prepare sundals to go as a side dish or snack. 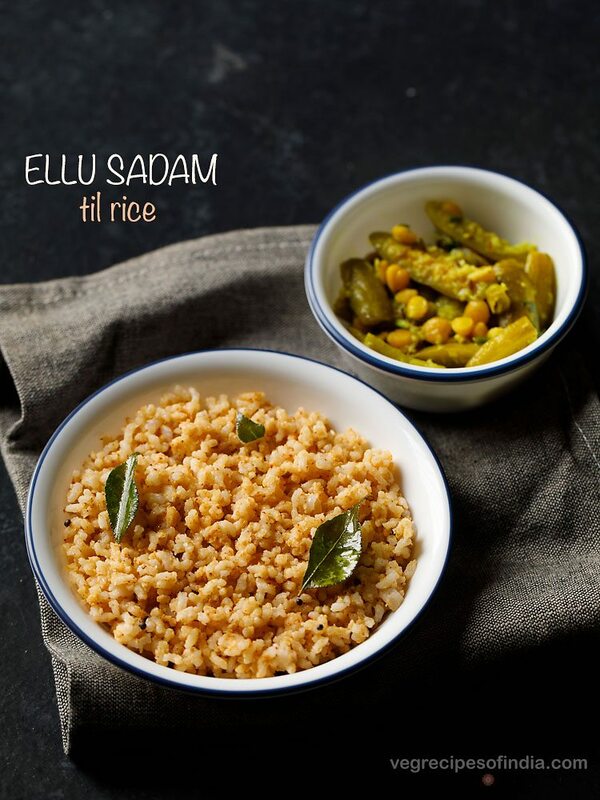 sundals can be made with legumes like chana dal, moong dal, kidney beans, chickpeas, black eyed peas, green peas etc. nuts like peanuts can also be used to make sundal. 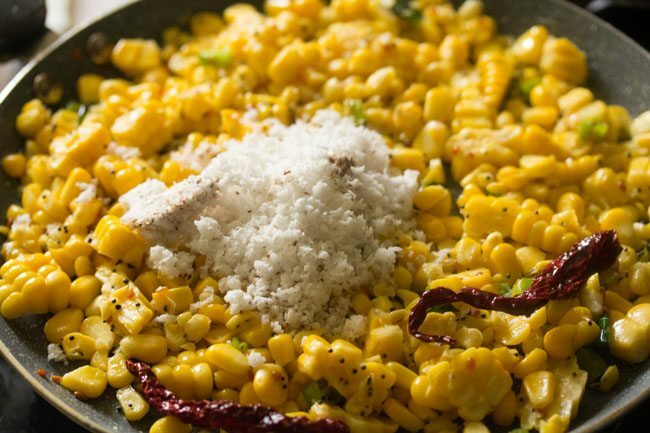 to prepare sweet corn sundal you will need steamed corn. if preparing for your deity, then use fresh corn and then steam it. 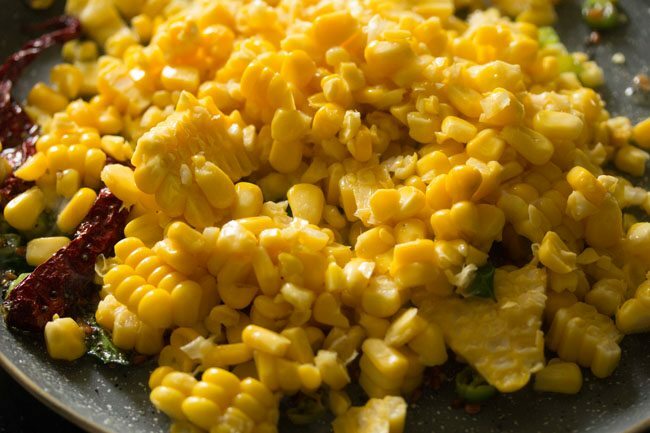 if preparing for family, then you can use tinned corn. here i have used fresh sweet corn. steamed it and then sliced off the kernels. 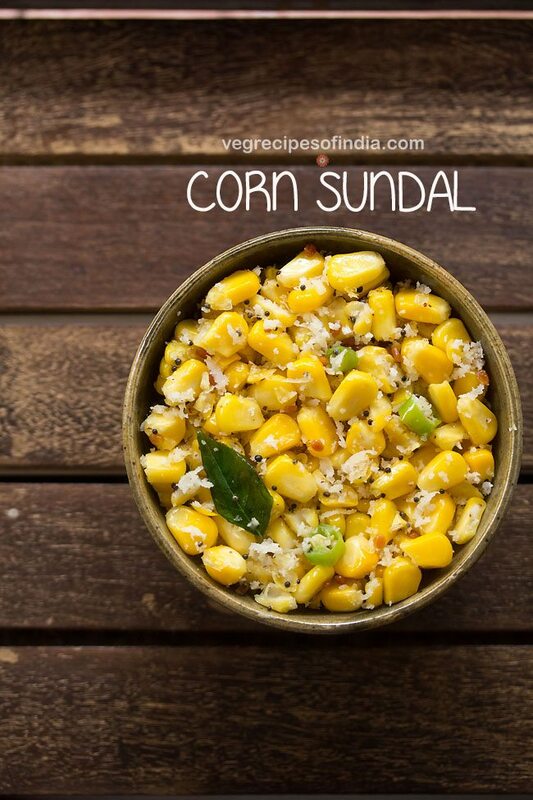 serve corn sundal as snack or a side dish. firstly steam or boil 2 medium sized corn cobs in a pressure cooker or pan. if using pressure cooker, then add enough water covering the corn cobs. pressure cook for 4 to 5 whistles. once cooled, slice of the corn kernels from the corn cob. you will need 2 cups of corn kernels. heat a pan and oil. when the oil becomes hot, lower the flame. then add the mustard seeds and urad dal. stir well. 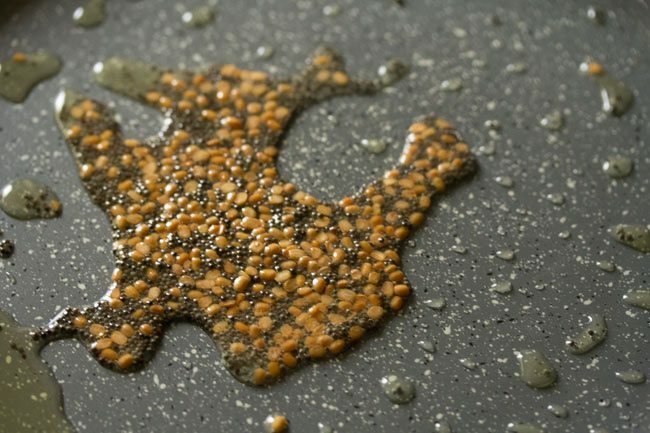 let the mustard seeds crackle and the urad dal turn golden. do take care so that the urad dal does not burn. then add the green chilies, dry red chilies, curry leaves, asafoetida. mix very well. add the steamed corn kernels. season with salt. mix again very well. saute for 2 to 3 minutes on a low flame. switch off the flame and add grated fresh coconut. mix very well. serve corn sundal. 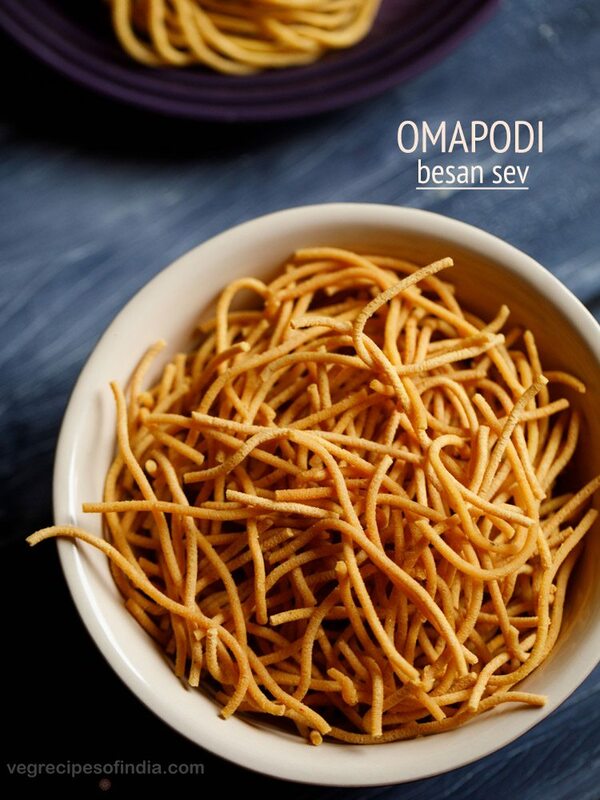 if you want you can garnish with some coriander leaves. 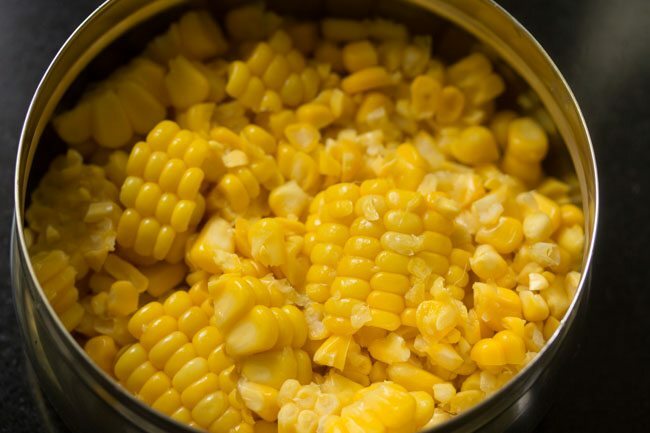 1. firstly steam or boil 2 medium sized corn cobs in a pressure cooker or pan. if using pressure cooker, then add enough water covering the corn cobs. pressure cook for 4 to 5 whistles. once cooled, slice of the corn kernels from the corn cob. you will need 2 cups of corn kernels. 2. heat a pan and oil on medium flame. when the oil becomes medium-hot, lower the flame. then add 1 teaspoon mustard seeds (rai) and 1 teaspoon urad dal (split and husked black gram). 3. stir well. 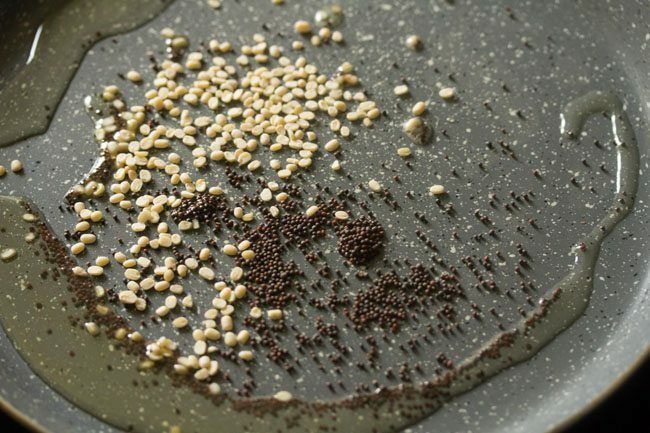 let the mustard seeds crackle and the urad dal turn golden. do take care so that the urad dal does not burn. 4. then add 1 green chili (chopped), 1 to 2 dry red chilies, 7 to 8 curry leaves (kadi patta) and 1 pinch of asafoetida (hing). mix very well. 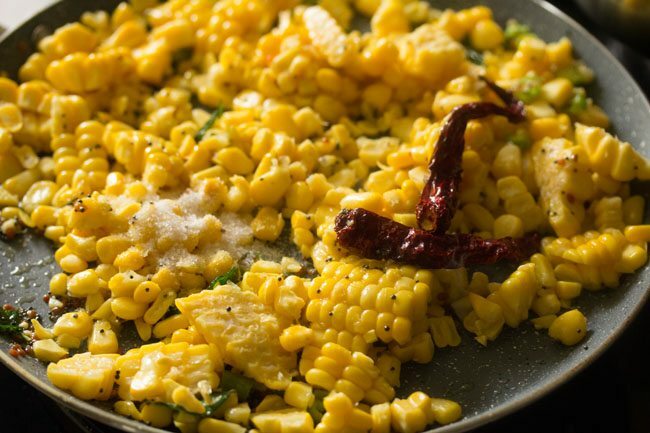 5. add the steamed corn kernels. 6. season with salt as per taste. mix again very well. 7. saute for 2 to 3 minutes on a low flame. 8. switch off the flame and add grated fresh coconut. mix very well. 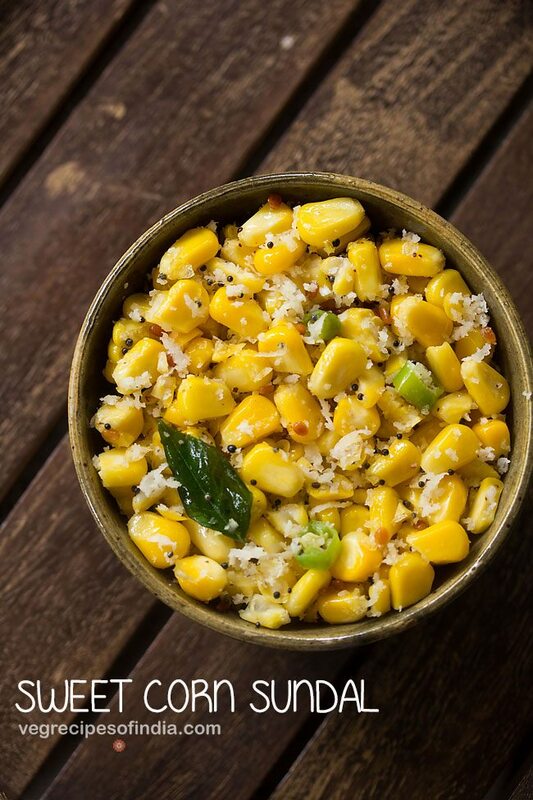 9. serve corn sundal. 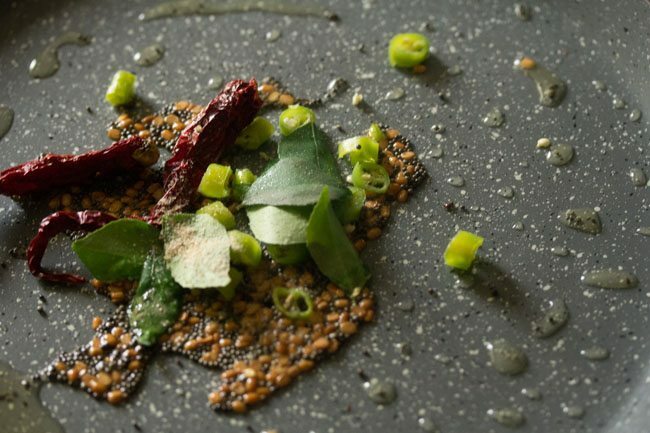 if you want you can garnish with some coriander leaves while serving. Your recipe was very tasty.